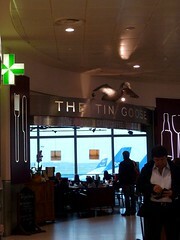 The Tin Goose was a decent pub in Heathrow Airport, airside of Terminal 1. It has now closed, along with all the rest of Terminal 1. A decent pub in Heathrow Airport, airside of Terminal 1. There's better than average seating for an airport outlet, with comfy large tables down the back and a range of banquette and booth seating nearer the bar, some alongside a large panelled window looking out to the planes on the tarmac. There's also a large eating area out the front of the premises, in the main terminal. There are three handpulls at the bar, with Adnam's Broadside, Young's London Gold (£3.65/pint) and Wells Bombardier in July 2012, and London Pride and Adnam's Bitter on an April 2009 visit. They also have a good winelist, which can be found on the website. Food is served at all times, with a small selection of starters and mains, as well as an all-day brunch menu photo of menu in Apr 2009. The roast vegetable tart on the mains menu was unavailable, so instead Ewan went for a slice of baked spinach & goat's cheese flan from the starter menu, but priced only 50p cheaper (at £6). It was perfectly nice though only partially warmed, served with chips (a little disappointing) and a bit too much greenery photo. On Ewan's July 2012 visit, music was playing and not exactly quietly either (though it can be largely escaped by sitting in the area outside in the concourse). Last visited by Ewan, July 2012. Last edited 2015-08-11 07:32:55 (version 8; diff). List all versions. Page last edited 2015-08-11 07:32:55 (version 8).